There are a few people that I see as a real influencers to the way I work add to my aspirations as to how I want to be seen by others. I also see others who are completely the opposite and are people who show me how it should very much not be done. One thing which tends to attract me to these people as representing either side of the scale is their overwhelming self confidence. 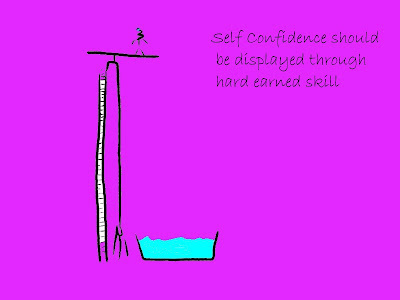 Don't get me wrong, self confidence is very much important in this new world, however, the more you express it without proper personal backup, the more you are setting yourself up for a very hard landing one day.